← Warhawk Book Talks – Feb. 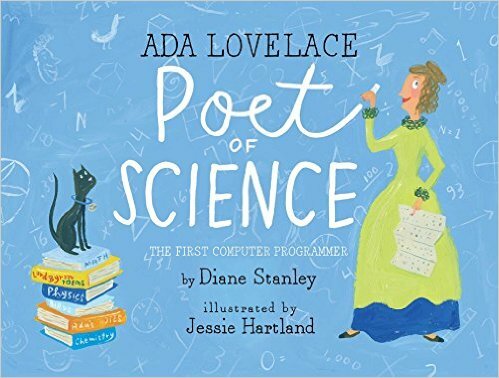 Starting with the title, this biography of Ada Lovelace in picture book format focuses on the genius that emerges when artistic creativity and scientific precision work in tandem. She was born to poet Lord Byron, whom she never knew, and a mother who had a love of math and science and little patience for fantasy. With little interest in pursuits expected of a young woman of her time and social standing, she found herself drawn by the company of the likes of Dickens, Darwin, and Charles Babbage, often referred to as the father of computing. Babbage wrote an article about how to build a machine that would calculate mathematics, but not how to make it work. Given her understanding machines, Ada Lovelace translated the work from French to English, adding footnotes which explained how such a machine could be programmed for practical uses even beyond that of mathematical calculation. The picture book story is appended with discussion of some controversy concerning her contributions, as well as a timeline and bibliography. To locate additional inspiration for the young creative scientist, more titles featuring Ada Lovelace can be found in the Curriculum Collection. For a more in depth reading, check out Ada’s Legacy by Robin Hammerman and Andrew L. Russell, from Andersen Library’s Main Collection.